bummer. thanks for the warning! Didn't and won't be trying this and simply clicked in to say how much I love your site! 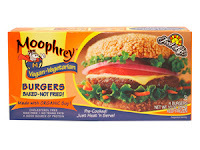 Very useful and helpful even though I don't use a lot of fake meat products. I am curious about some and this place gives me a heads up to buy or maybe not. My favorite is Gimmie Lean breakfast sausage and I am now dying to try the Italian soup with white beans and kale recipe you have under that review. Thanks again for a great place. Actually, to me, these tasted delicious. I was thrilled to find a delicious tasting meat substitute. My gripe is that they list this burger as only about 10% fat. There is no way they are that low in fat. Just by handling the burgers my fingers got oily and/or greasy just as if I had handled real meat. What? I love these burgers! They're my favorite kind! Oh well, different strokes for different folks I guess.